Growing up, my mother made stew all the time. Comfort food. This is my vegan version and it is just as comforting! Heat grapeseed oil in a deep pot. Chop the onion into chunks and add to the oil. Chop the carrot into chunks and add to the pot. Peel and chop the potatoes and add to the pot. Cover with tomato sauce and water. 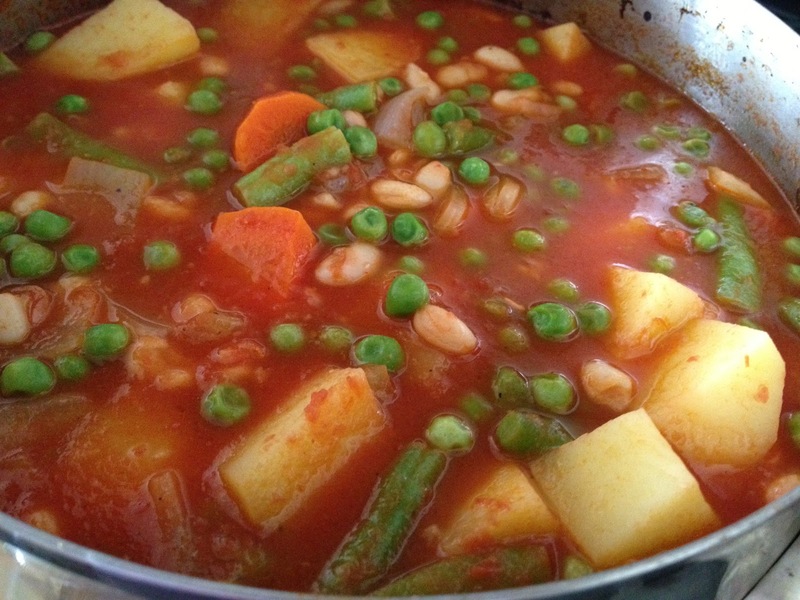 Bring to a boil and then reduce to a simmer to cook the vegetables and potatoes. Clean the green beans and add to the stew. After 10 minutes or so, add the beans and green peas. Season with salt and pepper. Cook on a low flame for another 10 minutes and then turn off the flame. Let the stew sit for a while. Reheat when ready to serve. Enjoy! Fabulous looking stew, Lisa! Can't wait to try it. I've also shared this one with my business page on Facebook! thanks and appreciate the post…will like your page too!